All of these religious themed paintings that were photographed inside the Museum of Fine Arts Houston come from the section titled European Art from the 1400s to the 1800s. The vast majority of the ones presented in this post are from the earlier days with some of them estimated dates. 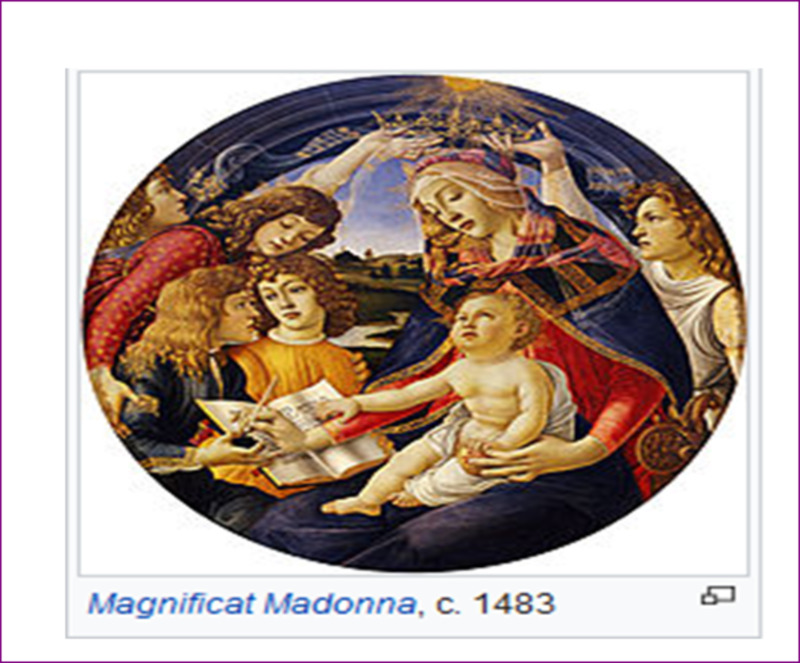 In some cases those early artists are not even identified for certain and knowledgeable guesses have been made as to which master might have been the creator of such beautiful and inspired pieces of religious art. Most of this section showcases the religious art related to Christianity. Are you ready for this tour? Come along as we explore some of these masterful creations. This first painting which is an oil on panel is a perfect example. It is attributed to Pietro degli Ingannati but there is some confusion as to who he actually was. Most art historians think that he was Italian and actively worked from 1529 to 1548. Whether he painted this beautiful piece under this name or another name, the end result is a thing of beauty. 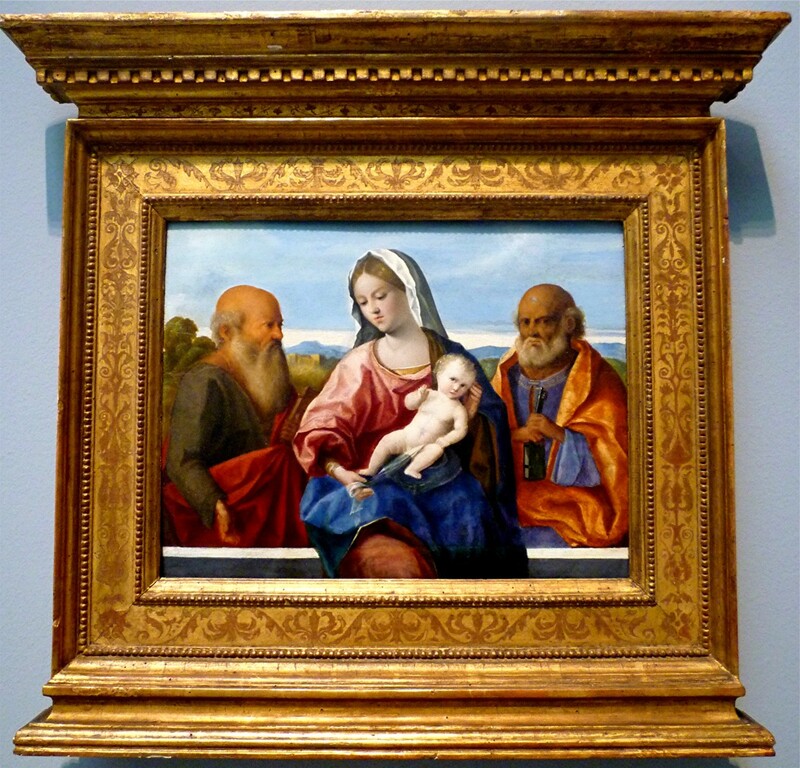 Titled The Madonna and Child with Saints Peter and Paul this now graces the walls of the Museum of Fine Arts Houston and can be enjoyed by countless viewers. A Belgian artist who lived from 1787 to 1869, this oil on canvas was painted by Francois-Joseph Navez in 1823. It is titled: The Incredulity of Saint Thomas. Most Christians know the story of "Doubting Thomas." After Jesus Christ was crucified, died and rose from the dead, Thomas indicated that he would believe in the resurrection of Christ only if he could see Christ in person and satisfy himself that Jesus was indeed alive after the horrors of that death on the cross. 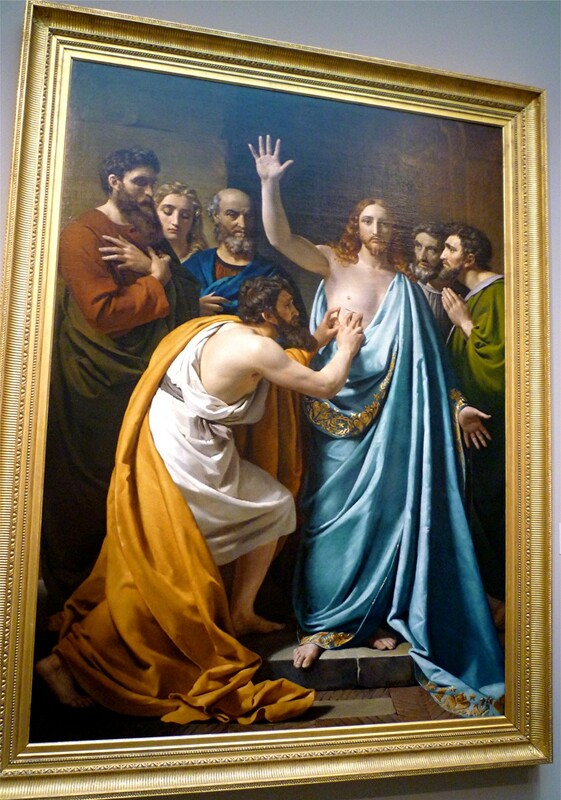 This painting tells that story graphically with Thomas placing his hands into the wounds of the risen Christ's body. Here the artist is not in doubt. Sebastiano Ricci was an Italian who lived from 1659 to 1734. It is only the date of this masterful oil on panel that is in doubt.The Last Supper was probably painted in the 1690s. In this elaborate work of art Jesus is shown sharing his last meal with his apostles. This took place prior to his being betrayed by Judas (one of his 12 apostles) the next day and subsequently suffering the fate of crucifixion which was generally reserved for those committing heinous crimes. This Netherlandish or Dutch painter and engraver was one of the last Mannerist Painters of his time. Wtewael (also spelled Uytewael) lived in the years 1566 to 1638 and painted this oil on canvas titled Annunciation to the Shepherds in 1606. The style of mannerism often had exaggerated figures such as elongated body parts or overly muscled people being portrayed. In this painting the subject matter addresses the shepherds who were watching their flocks of sheep being awakened by angels announcing the birth of the Christ child. Born in 1499, Petrus Nicolai Moraulus lived to the year 1576 which was a ripe old age for that day and time. 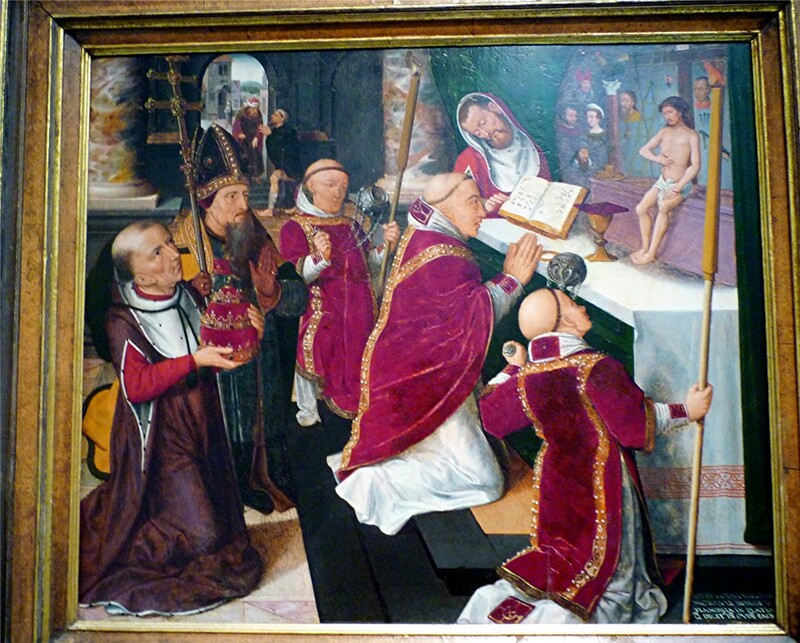 The Mass of Saint Gregory was a painted oil on panel completed in 1530. Saint Gregory the Great was the Pope and head of the Catholic Church from 590 to 604. There is a lot of symbolism going on in this particular painting. Tintoretto was actually a nickname. This artist's real name was Jacopo Comin. Also known as Jacopo Robusti, he was the eldest of twenty-one children and was the son of a dyer or tintore. At an early age Jacopo started drawing and painting and showed extraordinary talent. For the very briefest period of time he was a student of Titian. 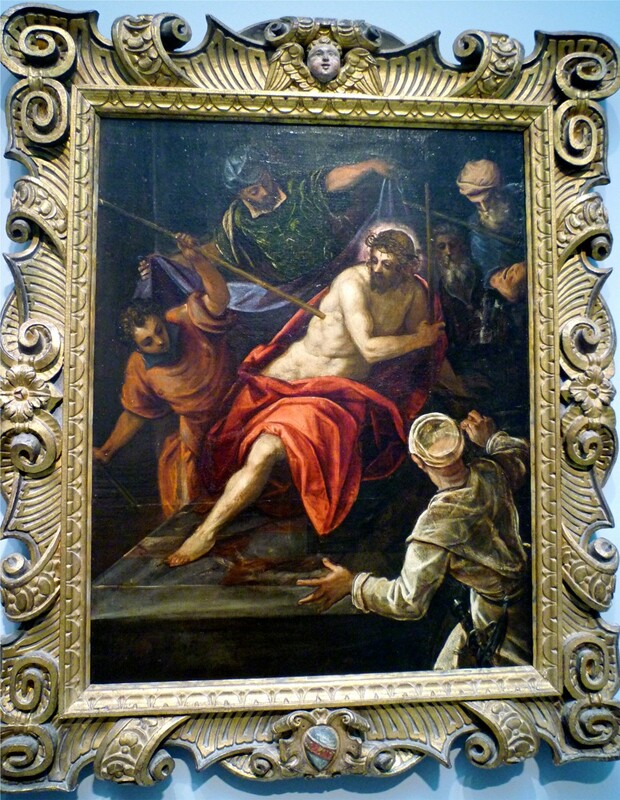 An Italian (1519 - 1594) he produced this oil on canvas work titled Mocking of Christ between the years 1585 to 1590. Tintoretto was a prolific producing artist and here he portrays Christ as being taunted and tortured prior to his crucifixion and death. 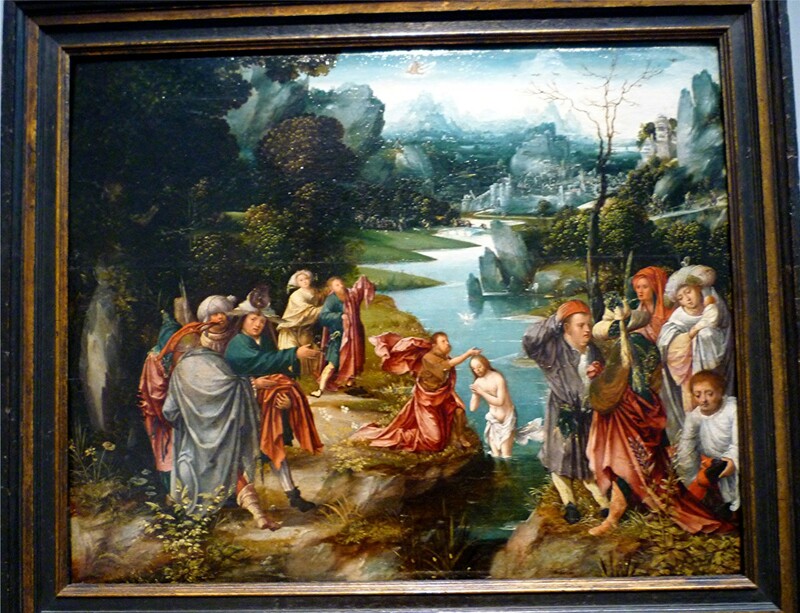 Baptism of Christ was probably painted in the 1520s by a "South Netherlandish" artist. In this painting St. John the Baptist is baptizing Christ. Obviously this is a descriptive title rather than a real name. A very talented anonymous artist who probably was Netherlandish around the years 1460 to approximately 1533 executed this oil on two panels around 1500. Holy Kinship portrays the Virgin Mary holding the Christ child along with her mother Saint Anne and surrounding family members. This was a popular theme in religious art of the 15th and 16th centuries. There is some speculation that the Master of Frankfurt might have been the Flemish Renaissance painter Hendrik van Wueluwe according to some accounts. 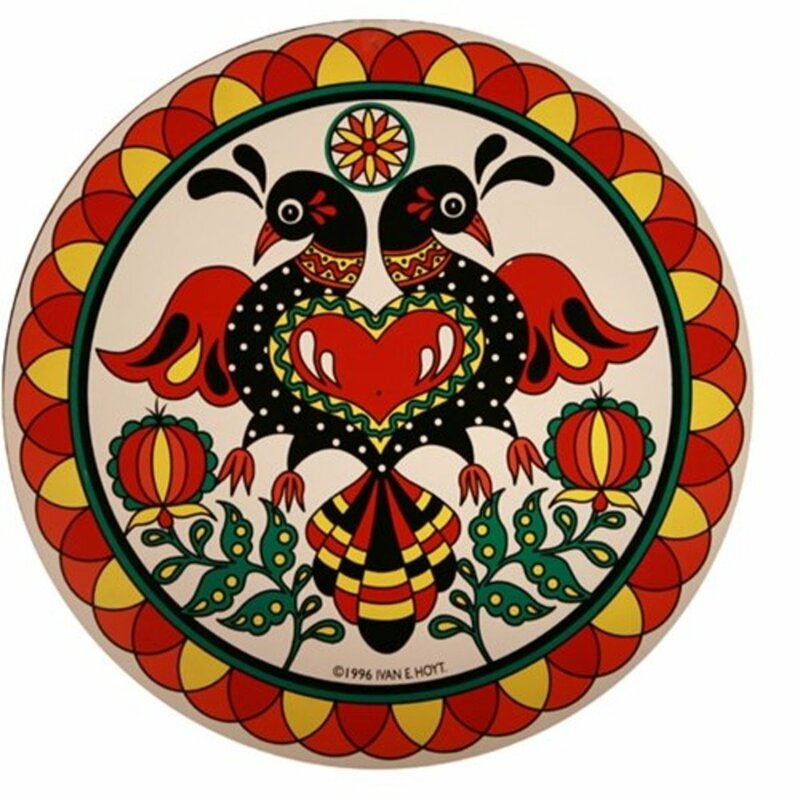 This is solely based upon the type of painting done in that era by that artist but is not known for certain. 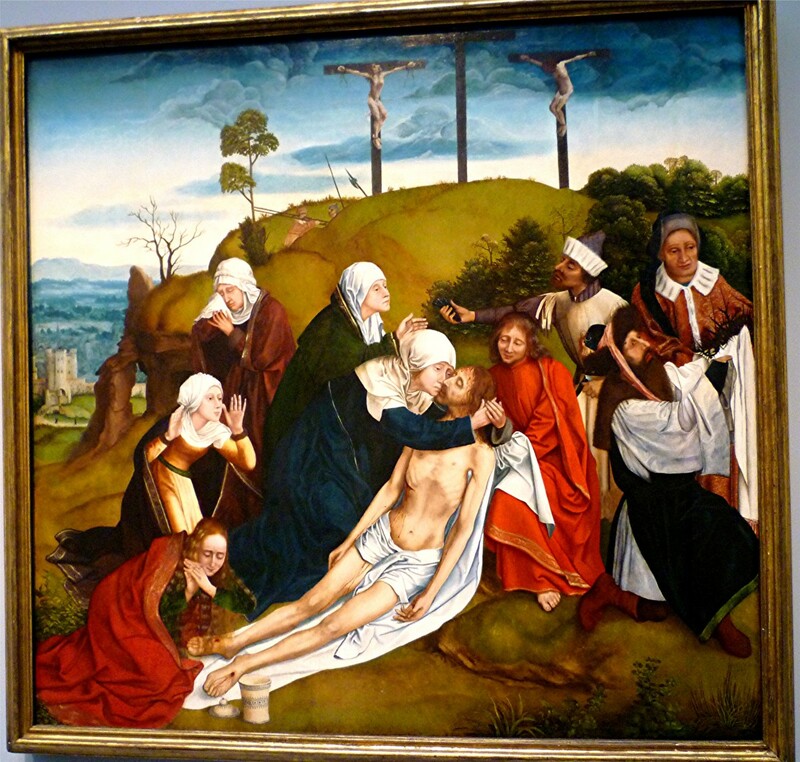 Lamentation is attributed to having been painted by Quentin Massys, a trained iron-smith turned painter. He was Netherlandish and lived from 1466 to 1530. This oil on panel was created in 1520. Depicting the sorrowful scene of the dead Christ having been removed from the cross, many loving figures surround Him while the two thieves who were executed at the same time still remain up on their crosses. An Italian who was born in 1475 and who died in the year 1554, Giuliano Bugiardini painted this oil on panel in the 1510s. 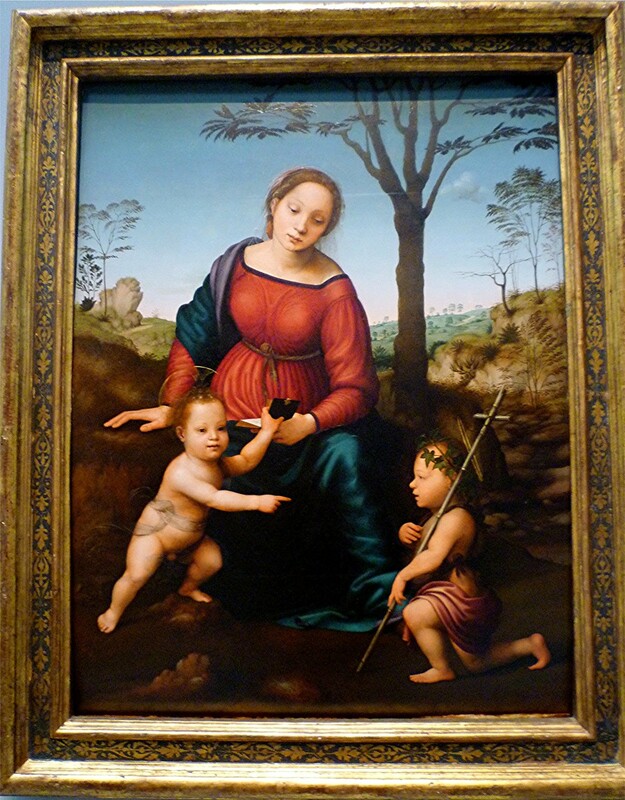 Madonna and Child with Saint John the Baptist was in the Italian High Renaissance style of painted composition. According to the plaque next to this wonderful work of art, figures were often arranged in a pyramid form. It can easily be seen here with the Virgin Mary forming the top of the pyramid and the babies Jesus Christ and Saint John the Baptist at the bottom forming the base. 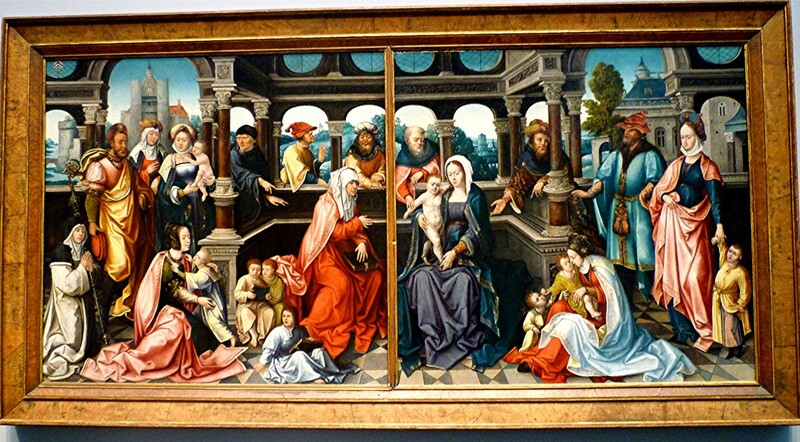 Netherlandish (1506 to 1566) this oil on double-sided panel was created in 1541. 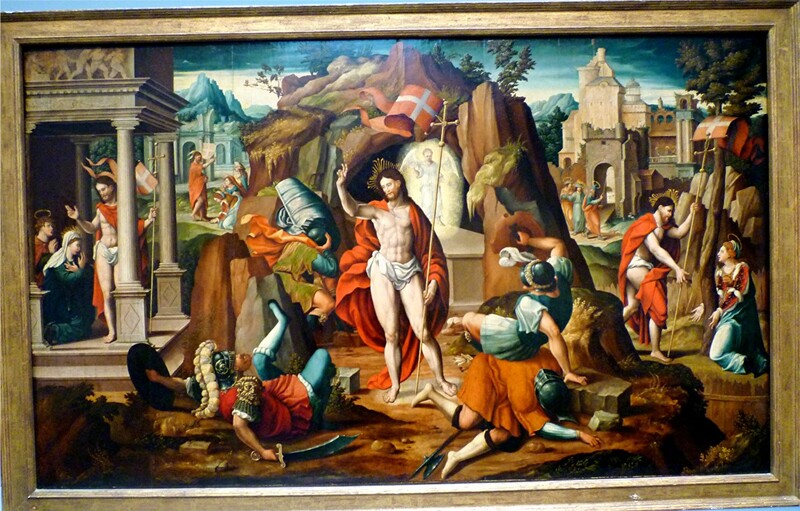 Titled Scenes of the Passion and Resurrection of Christ it shows many episodes in the Life of Christ and undoubtedly graced some church altar for many years. Now residing in the Museum of Fine Arts Houston it is just one of many admirable religious paintings dating back to European Art from the 1400s to the 1800s. Which of these paintings is your favorite? I like many of them and cannot choose just one as my favorite. Hopefully you enjoyed this look at a few of the religious themed paintings from the European era dating back to as early as the 1400s in the Museum of Fine Arts Houston. Obviously there is much more to see! Would you be tempted to visit the Museum of Fine Arts in Houston to see more of their collections of religious themed art? Definitely, in a couple of minutes a docent can tell much about the work, the artist, and the times in which the artist painted it. My aunt was a docent at the Milwaukee Art Center and it was so interesting looking at paintings with her ability to point out various things about not only the painting but what the artist intended. That is one benefit of seeing shows with docents to guide one through an exhibit. I remember when a friend of mine pointed out the mistakes in Da Vinci's last supper. Such errors in paintings and movies always interest me. It is obvious that you note things that are out-of-place in paintings as to the timeframe of what the painting portrays. 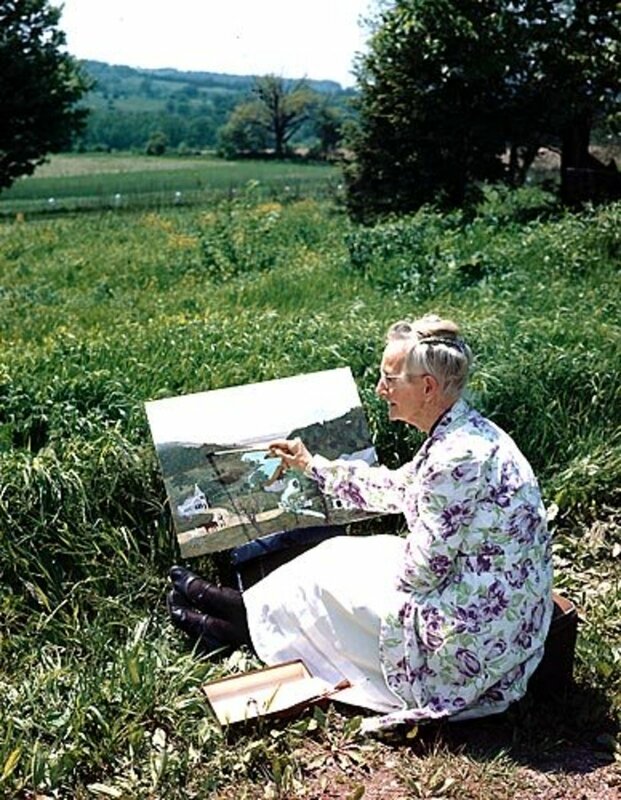 Many artists obviously do not feel such constraints when painting the image. I doubt that many people notice such things when casually looking at art. I don't know much about art but have noticed these oddities by seeing paintings in art museums. There is the MET of course. I remember seeing a piece of art in the Smithsonian that depicts Christ's crucifixion. They have soldiers in the painting that have 14th century armor on. It would appear that you know much about art as well as airplanes. Your education is well-rounded as to various subjects. Thank you. Such anachronisms are typical of the paintings of the time. They seemed to be better artists than historians. That's why paintings of the13th and 14th century often depict King Arthur and the Knights of the Round Table in 13th and 14th century armor rather than 6th century armor. You have good eyes in making note of these things. The clothing, in many of the paintings the clothing was modern, for the period the painting was made, rather than the first century. The last supper has the figures sitting at a table when they would have been reclining. Religious paintings certainly do tell a story on canvas. Did you notice something chronologically out of place in one or more of these paintings or were you just referring to them in general? Thank you for the tour. I like these styles of painting. They capture a story on canvas. 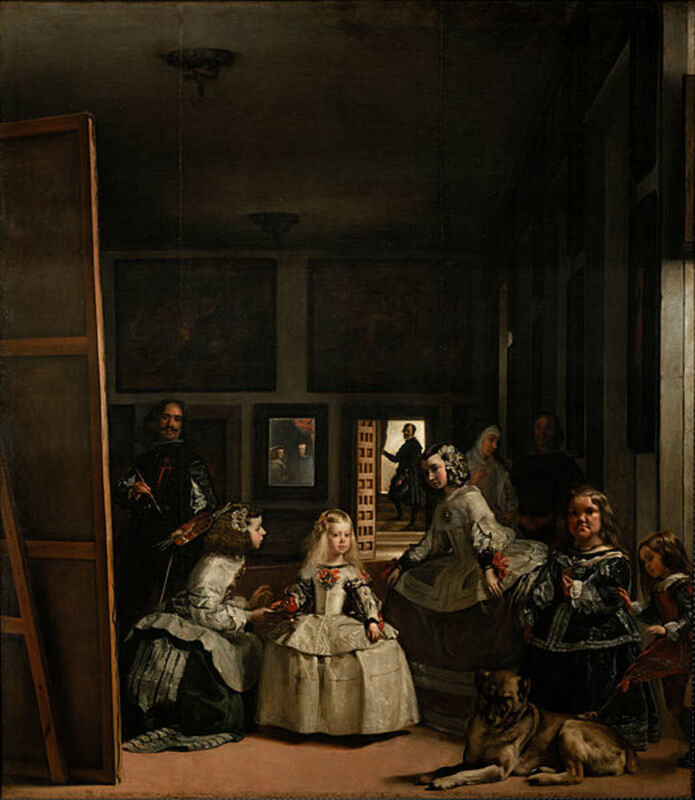 Another interesting aspect is the anachronisms in the paintings of these periods. So glad that you enjoyed this "tour" of some of the religious themed paintings inside of Houston's Museum of Fine Arts. It is a wonderful museum filled with all types of art to suit just about anyone's taste in art. Thanks for your comment. I have a number of art related as well as museum hubs. Glad to hear that you enjoyed this one with religious themed paintings inside of Houston's Museum of Fine Arts. Thanks for your comment and votes. I can't believe I missed out reading this one; still beter late than never I guess. Your hubs are always amazing and beautifuly presented. So glad to hear that you found this hub enjoyable. Thanks for your comment. Beatiful art. I enjoyed this very much. You have this laid out beautifully and it is easy to understand. Keep up the great HUBS. Up one and beautiful. I'm now your fan! I agree with you. Houston does have an incredible amount of art for viewing. Already did a piece on the Rothko Chapel and the Byzantine Chapel Museum! They are both jewels and free for viewing with no admission fees thanks to the legacy of the Menils. I personally love the Byzantine chapel. Houston has an incredible art collection both private and public. You could add in the Rothko chapel and the Byzantine chapel as side tours to the MFA religious art too Peggy. 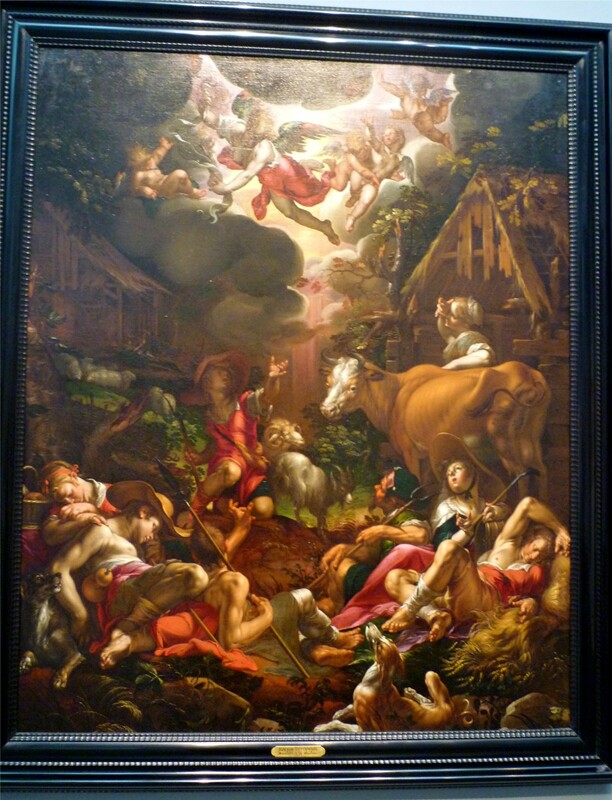 Houston's MFA has great religious themed paintings and so much other art that it would take a while to see it all. Two buildings connected by a tunnel and multiple levels in each building house great art. It is in the "museum district" of town which also has many other great museums in the area as well. Thanks for the visit. Very nice Peggy. If this were in town I'd check it out. Thank you. I figured that if you discovered this hub you would enjoy taking a look at the religious themed paintings inside Houston's MFA. Naturally there are many, many more! Tintoretto was a master painter for sure! Thanks for the visit. Thank you for publishing this fine gallery. Love the Tintoretto. I totally agree with you that these religious paintings at the MFAH are beautiful. Just a sampling, of course! Thanks for the visit and comment. 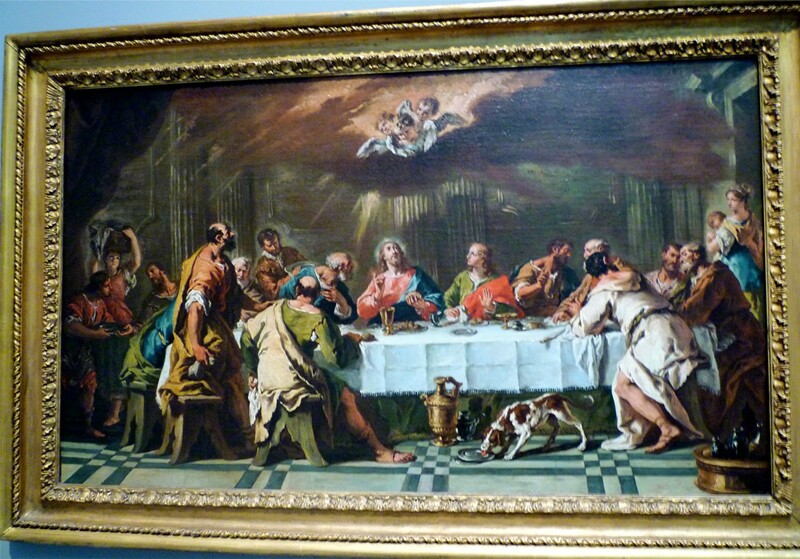 Tintoretto and others...so many great artist's works displayed inside Houston's MFA. Thanks for the visit and comment. these are great! I love Tintoretto. If you liked the religious themed paintings displayed here in this hub, you would LOVE seeing all there is to offer in the Houston Museum of Fine Arts as this is only a sample. The MFAH is one of the better endowed art museums in our country and therefore offers much to the general public by way of permanent and also traveling exhibits. Thanks for the visit and comment. Thanks Peggy for giving me the chance to tour the MFA's religious art collection with you. A very informative hub with lovely photographs. So happy to see that you are enjoying these views of paintings and artwork inside Houston's MFA. It is wonderful that the MFAH allows the taking of pictures in some areas of the museum with non-flash photography. Thanks for the comment. Thanks for taking a look at this religious themed paintings hub from the MFAH. Besides the beauty of many of these paintings, I think learning more about the artists and what influenced them at the time is also of interest. Very happy to have taken you on this tour of religious themed art in the MFA of Houston. Thanks for the comment. some art work,its real great art work,show more of it please. The MFA in Houston is filled to the brim with wonderful pieces of every type of art. You would really enjoy a visit especially since you also create art. Thanks for the visit and comment on this religious themed paintings hub. Thank you very much for your guided tour showing all these great Masterpieces I would have never seen otherwise. There is so much wonderful artwork inspired by religion and religious themes. 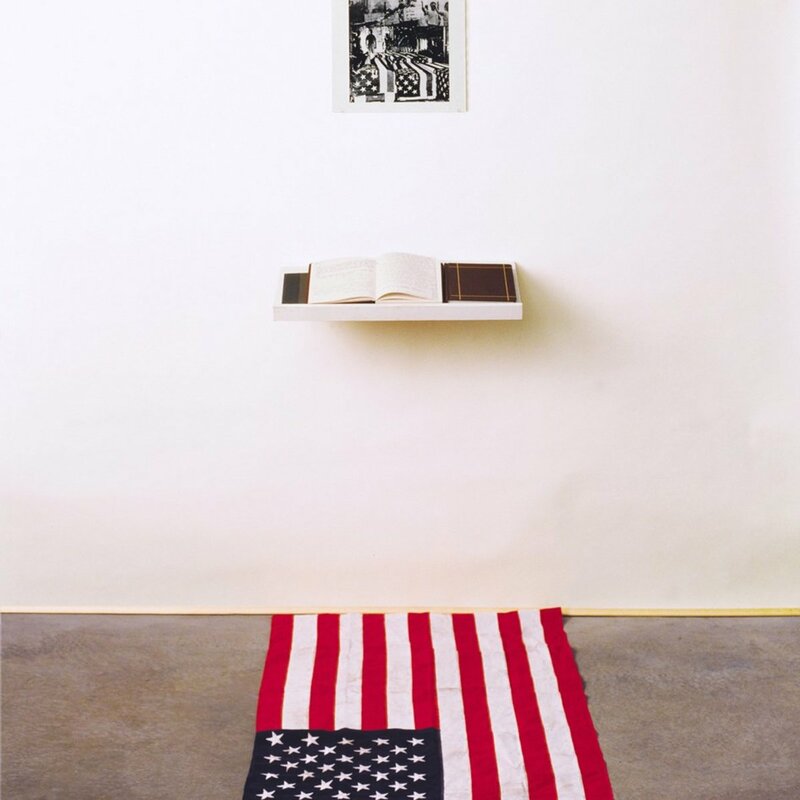 It certainly appears that the MFA in Houston has a great number of oustanding works. This is another fine hub and I would definitely visit the Museum in Houston if the opportunity arose. Thanks for sharing. Like you...there are many things that I would like to have studied if I were to take a step back in time. However...it is never too late to learn new things and thanks to the Internet that we have at our fingertips...we can continually learn. Happy to hear that you liked these pictures of some of the religious themed paintings inside of the Museum of Fine Arts in Houston. Thanks for your speedy first comment on this hub. Very nice collection. 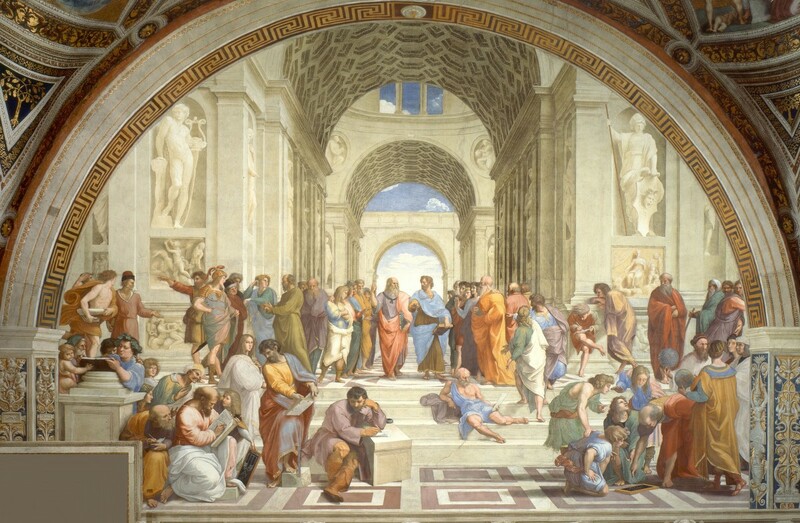 I wish I had the time in college to study more art history. You also do a nice job of photographing these pictures which many of us may never have the opportunity to see first hand.